Spirit jar for A., the Strategist. As many of you know, I’m a big fan of Jason Miller’s Strategic Sorcery course. He has some great techniques and a sensible, straightforward syllabus that is an effective crash-course in magick and conjuration. The lesson on spirit bottles is one of the most respectful approaches that I’ve seen, considering that many traditions have long and tangled histories around the practice. One of the best things Miller does is get into the differences between local and non-local spirits, i.e., beings like the archangel Uriel vs. the nymph of a particular pine tree. When making a spirit bottle or house for someone like Uriel, he’s so big there is absolutely no way that you’re actually going to cram all of him into that little bottle–no matter how good a mage you think you are. 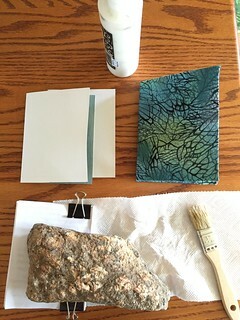 What you can do is make a connection and give that non-local entity a foothold in your space so that you can develop a much deeper relationship. Unfortunately, there is a very strong association with the term “spirit bottle” or “spirit house” and the practice of binding a spirit against its will to work for the sorceress. However, as Miller wisely points out, you really don’t want to trap a spirit in a bottle. If you’re good enough to actually pull that off, you’d have one extremely pissed off spirit on your hands. You’d be far better off performing a solid banishing ritual and pushing it out of your life completely. Why keep an enraged entity (who will eventually more than likely escape and wreak havoc on its jailor) in your space where it has a direct line to carry out its vengeance? Not really smart when you think about it. Then, there’s the simple matter of manners. Speaking from my own limited experience, spirits do in fact have agency; they don’t necessarily want to sit around on your altar all day waiting for your requests. Treating a bottle or house as a place for an honored guest to visit is a much more hospitable approach; to say that the beings with whom I work are big on hospitality would be an understatement. When I use a spirit bottle, I’m seeking a contemplative relationship with the entity, rather than a power-over relationship. Reliquaries do, in fact, serve a very similar function to spirit bottles, but with a very different set of expectations. Often elaborate and opulent, reliquaries are at their simplest boxes with an object (relic) closely associated to a particular saint or miracle worker. That object is often a bone, but can also be a piece of clothing or hair. In short, it’s very similar magickal tech to a spirit house, which often includes items closely associated with the spirit’s nature, as well as tools for the spirit to carry out its work. Now, there is a difference in that certain types of spirits do not leave physical traces to include in a reliquary, but when working with plant and animal spirits, physical material is readily available. 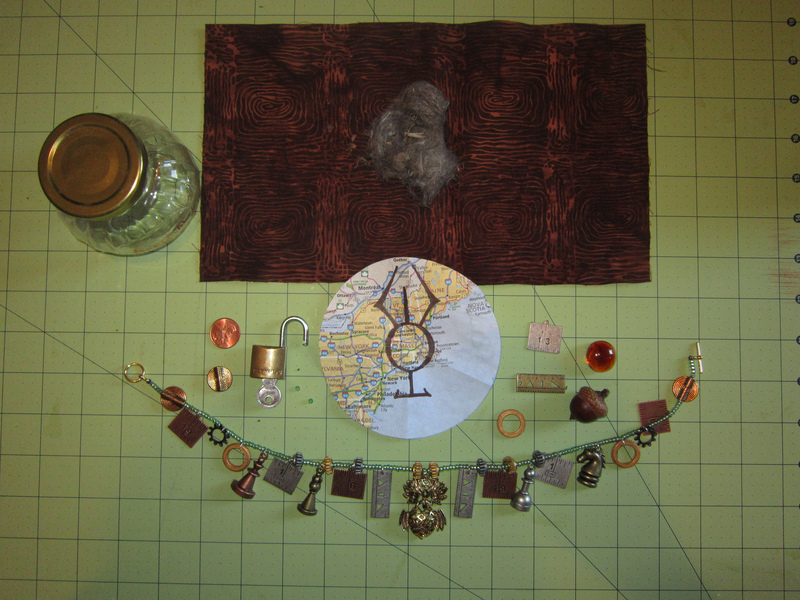 Thus far I have created one spirit bottle/reliquary (pictured above) for a non-Midgard being, A., from Miller’s personal grimoire. 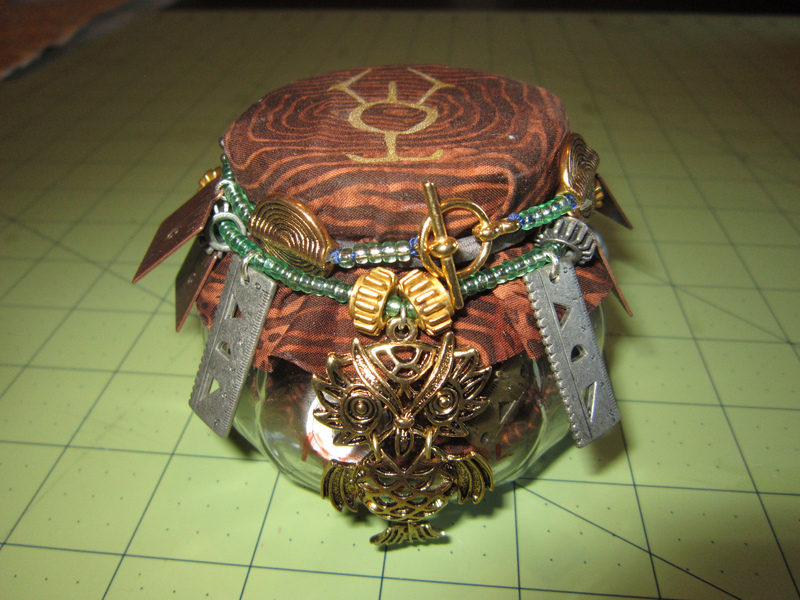 There are tools and symbols inside the jar, as well as a map of where to extend his influence. On the outside of the container is a necklace with still more symbols of this being, which I wear when working with him in ritual. The jar sits on my altar and once a week or so (more often if there’s other work to be done), I pour him out a libation. He is fairly low-maintenance, and we both find the current arrangement satisfactory. 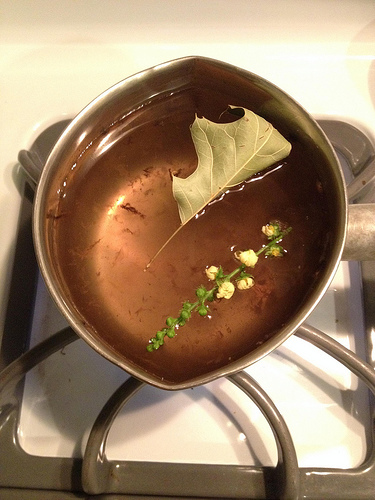 For spirits grounded in this world, I have materia for Turkey, Crow, Frog, Rabbit, Mugwort, and Datura. I have not as yet designed the spirit boxes, but this may be a good Yuletide project–to reaffirm my connections with the genius locii of our land. (The other questions, of course, are of storage and display, and offering frequency. Making sure everyone is fed and happy can turn into a full time job if expectations are not made explicit at the outset of the relationship. It’s also an argument in favor of not acquiring more allies than one can properly honor.) Making the reliquaries is a slow process, both in terms of physical assembly and putting the whammie on the final product. Still, it’s one of the most worth-while magickal processes I’ve engaged in. To conclude, one the the main reasons I consider myself a Druid is because of the emphasis on being in right relationship–with our ancestors, our landwights, our gods, our bodies, and our communities. Druid magick, in my opinion, needs to reflect this fundamental principle. Wyrd runs thickly throughout our lives, connecting us in ways that may remain hidden for years or even lifetimes. Reliquaries offer a way to emphasize major nexuses in the web where our threads cross those of other beings, points that we can reinforce through right action and ritual. Eventually, with enough time and work, each nexus brightens until it illuminates other surrounding threads in our wyrd–ones which would otherwise be beyond our sight. It’s a scary confession for a Druid to make, but I’ve not felt at home in my Grove for a while now. The Grove that I (used to?) work in most frequently is a lovely little spot down in the conservation land bordering our village. 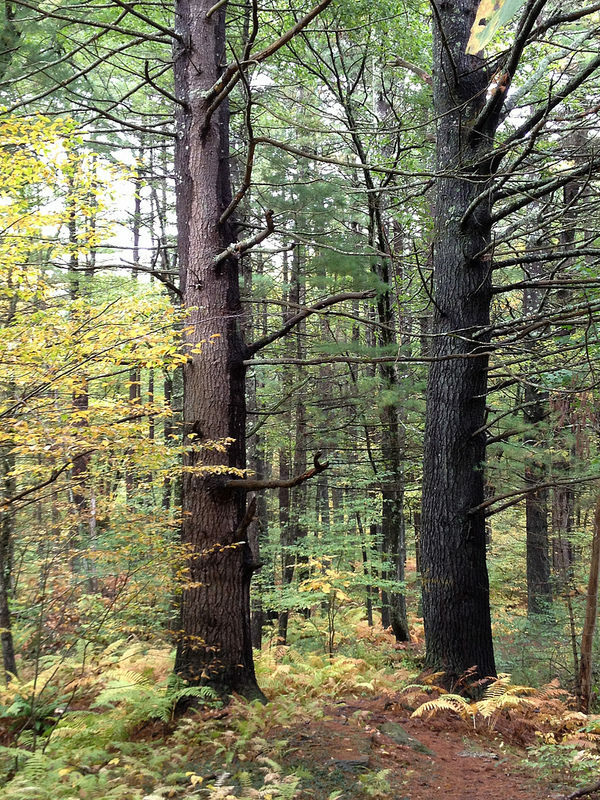 There are actually two rings of trees, the inner consisting mainly of maple and birch, the outer of red oak and white pine. I’ve been visiting, meditating, and performing ritual here for over three years now. Yet in the past few months, I’ve only been feeling tolerated instead of at home. The sense of displacement so strong yesterday that I didn’t say more than a quick hello before moving on. It wasn’t that I was unwelcome, per se. It was more like a shoe that you’ve worn too long and has started pinching your toes. Part of me wonders if the changes I’ve been experiencing in my inner grove are now manifesting externally. It will still be a great place to hold public celebrations, but we’re no longer in sync when it comes to my personal path. I continued walking through the forest. I had Ovate work that I needed to do, Grove or not, so I let my feet pick their own direction, over the muddy gullies, up a ridge and back down to the brook. When I came to the bridge, my breath caught. I’ve crossed this bridge many times before. I’ve dangled my legs over the edge, listening to the brook and making blood sacrifices to the mosquitoes. It’s not a particularly amicable spot–no trolls lurking, but not all buddy-buddy either. I expected the usual taciturn grumble. Today was…different. There was an inevitable acceptance that’s hard to articulate, like the boy with his finger in the dike finally got hungry and went home. Filing this experience away for later, I continued on the track that leads to the white pine grove. When I first began walking these woods, the grove was frankly just this side of terrifying. 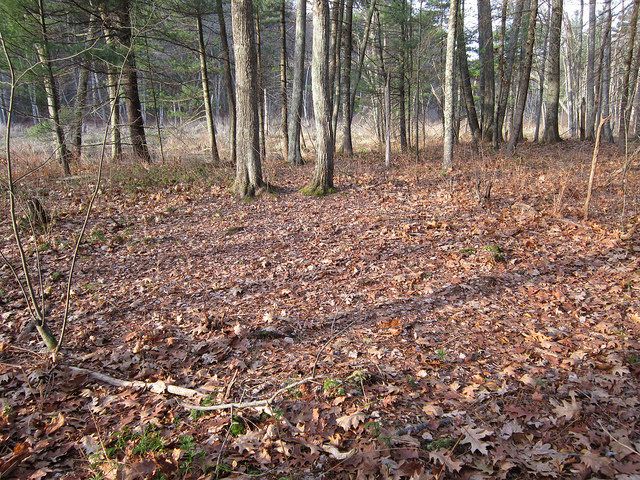 Dark, with creaking limbs and swampy bogs, the grove was something I passed through as quickly as possible. If it didn’t like me, that was just fine, but I would still leave a token or offering just to be polite. Because, you know, manners still matter. 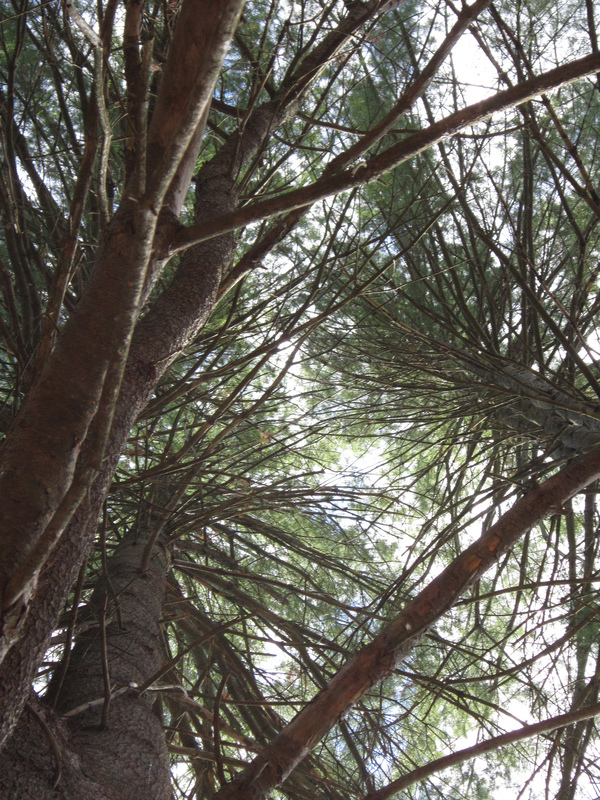 The entrance to the grove itself is marked by two huge white pines, whom I’ve nicknamed Gog and Nagog (a play on the oaks trees Gog and Magog at Glastonbury, and Nagog Pond, MA, the hill above which was said to hold the four winds). Unlike the rest of the grove, these twins are downright jocular, even chatty. I think they like playing pranks on hikers in particular, as there are a couple of paths whose location seems to move if you’re not very familiar with the geography. They are a pair to be reckoned with, and it’s little surprise that I’ve always slipped them a little something to stay on their good sides. If trees could be Goodfellas, I think I’ve now met them. As I passed between them, I could almost feel Gog and Nagog smirking. (Yes, trees can smirk.) The day was overcast, and I had slipped out for the hike in between showers. The pine needles were soft under my feet, highlighted here and there by the pink autumn leaves of Virginia creeper vines. Everything smelled wonderful, and I was filled with a sense of life and well-being. That was when the damned sunbeam hit me right between the eyes. You want to talk about Awen? That was Awen. Right-smack-in-the-face, full-singing Awen. The only sun we’d had all day, penetrating through the thick foliage of the grove to shine on me in a way impossible to ignore. I began chanting the ogham Ailm as the wind rose around me. Just to double check, I went to ask Bog Mama’s permission to study amongst her children. She’s a wonderfully supportive tree, earthy guardian of the inner part of the Grove, as much as Gog and Nagog are the watchdogs of the outer part. Nothing happens in this part of the forest without Bog Mama knowing about it. Touching her bark, I felt the deep and contented hum of her assent, though she clearly conveyed that she did not want to be part of any circle I established (the poison ivy that creeps across her feet emphasized this point). For the first time, I really began to look at the land in the grove, rather than pass through the kill-you-and-eat-you atmosphere as quickly as possible. What I had perceived as a few randomly placed farmer’s stones could become, with a little love, a right proper stone circle. I whipped out my compass to double check things. 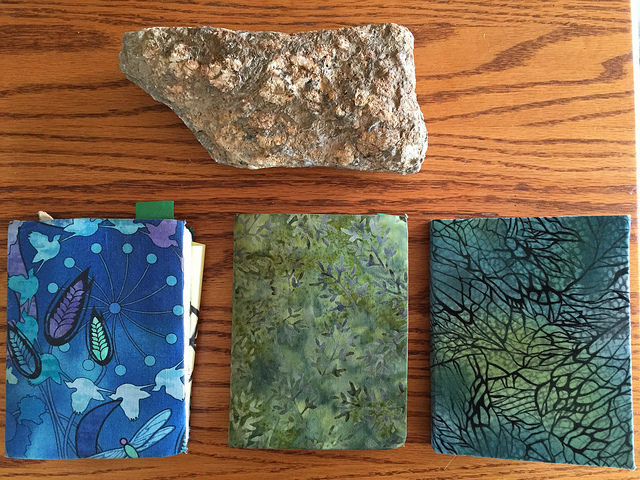 Stones stood in the NNW, WNW, and SSE. 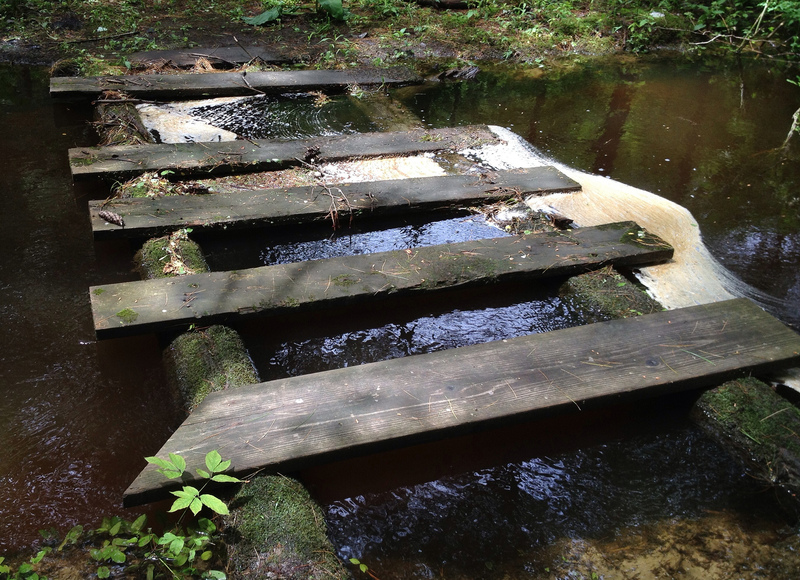 The waters of the brook were now in the east instead of the west as they were in the maple grove, but that’s not anything insurmountable (I’m one of those folk who changes directional correspondences depending on what’s actually going on in the land around me). There was even a y-crossroads within the grove itself, a place where all manner of spirits might gather. Finally, the symbolically-significant entry into the grove by crossing first the stream and then passing between Gog and Nagog can’t be beat. I need to sit more with the space to see what the other spirits of the grove might have to say, but I’m encouraged that this will be a fruitful place in which to finish my Ovate studies. I’m more than a little sad at moving out of my old grove. It treated me very well and I learned a lot there. Yet the change feels good and needed. Soul-deep. White pine bears the title “Tree of Peace.” I hope that I may find such and share it well beyond the grove. July has been a rather magical month all the way around. It’s easy to find components this time of year in New England. It seems like they’re veritably bursting out of the earth. First, I gathered some lavender for a house blessing that our Grove performed for one of our members. It was a wonderful ritual, with much drumming, smudging, food, and song. Not much surprise on the last two as this was the residence of a bard par excellence! The next bit of magic I concocted was for cleansing, warding, and brightening my dwelling space. I had been going through a particularly rough patch with the community, and needed a little extra boost to feel safe in my own space. 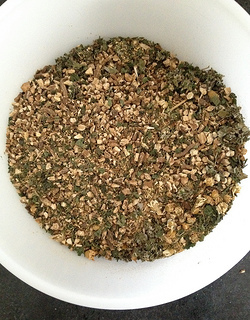 This was a mix of nettle and raspberry for protection, and dandelion and ginger for cleansing/enlivening. Worked pretty darned well, if you ask me. 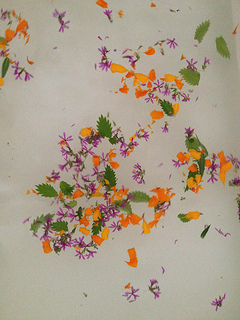 Before I had a particularly difficult meeting, I took a lustral bath with agrimony, loosestrife, and marigold. Smelled great and acted as the perfect relaxer. Last bit of spooky-fu this month was a lucky frog for a neighbor. She’s usually focused on banishing things, but if you don’t fill the void with something good, you’re just going to end up in the same place. 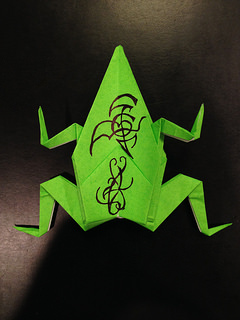 Since I have a soft spot for frogs and tend to think killing them in the name of a spell is bad juju for the health of your garden, I’ve started making origami frogs instead. Still effective in my experience, with without taking away a valuable predator from my veggies and herbs. Thunderstorm water, leaf from a lightning-stuck oak, agrimony.